After first seeing the trailer for developer Rogue Rocket Games’ Gunpowder ($1.99) last week, I was instantly taken by the game’s Saturday morning cartoon aesthetic, and more specifically, that of the old Wile E. Coyote episodes of “Looney Tunes". It’s a style rarely seen in today’s cartoons, much less in any video game, so it was a refreshing hook that baited me to pay attention to the game. Fortunately, Gunpowder is more than just a pretty face, and brings with it physics-based puzzle gameplay that balances on the fine line of accessible yet satisfying. Gunpowder has you assume the role of Incendio, a quiet civilian who quickly becomes the game’s protagonist after reading the tale of Robin Hood which, coincidentally, is the story of Gunpowder. The game’s villain, Boss Grimshaw, has swindled townsfolk from areas all over out of their money to help fund his new railroad, and it’s your job to blow up his many piles of loot and return the money to the helpless citizens of each town. You’ll do this over the course of 125 different physics-based puzzles played throughout five chapters, each having the ultimate goal of placing that one keg of explosives in just the right spot to cause the perfect chain reaction. At the start of the game you’ll only have a keg or two of explosives at your disposal in fairly simple stages. You’ll have to string them — and their explosions — together to reach the end of the level, where the loot is, using a finite amount of gunpowder that becomes lit from a nearby bonfire. Igniting the powder will begin the chain of events, and cause each keg to explode in a domino effect. The early stages can be a bit of a drag due to their severe simplicity, though soon after you’ll have hay-stacked wagons, cannons and even TNT added to the equation, where you’ll need to figure out how to get each to work together in more complex, Rube Goldberg-style chain reactions. They eventually all add up to make a game that has just enough complexity in each level to make it thought-provoking while not leaving you wondering what to do next for too long. Though if that does become the case, you can always skip the current level and come back to it at a later time. In addition to the main loot, placed throughout each level are three piggy banks, which can be thought of as the game’s three-star system. You’ll have to find ways to include their destruction in your elaborate plan of blast zones, because acquiring enough of them will unlock later chapters, or worlds, in the game. And again, breaking all three pigs essentially means you attained three-star status of the level. Each stage also has a target time to reach, though I never found myself too obsessed with that other than for personal gain and a higher score, as the pigs were my bigger focus — and breaking all three provided more fulfillment than simply just completing a level fast, at least for me. Gunpowder is light on narrative, though what is presented is done so through animated comic book panels, similar to what’s found in the popular digital comics app Comixology. 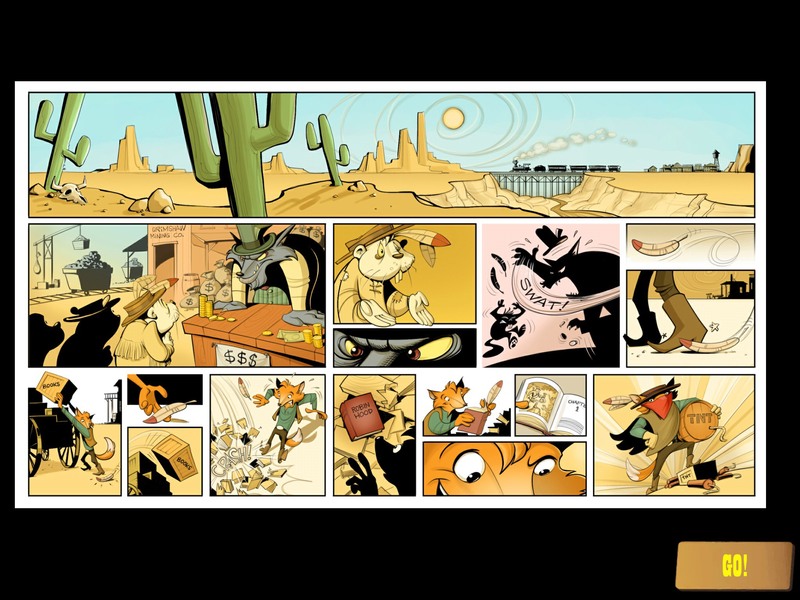 The beginning and end of each storybook chapter contains a comic panel “cutscene” that provides basic context of the unfolding events, and enough to push you forward to the next set of levels. It’s nothing too heavy overall, but narrative was also light in the cartoons from which Gunpowder takes inspiration, and those are still classics. Gunpowder follows the mantra of a little going a long way. I was initially bummed that Gunpowder was iPad-only, but after playing it for review I found that there is definitely a lot of information to take in on screen, between your remaining gunpowder, the amount of barrels at your disposal, as well as everything laid out on the map prior, such as the aforementioned Gatling guns. There’s so much to take in that even the iPhone 6 Plus would probably not provide the adequate space to comfortably play and strategize, so I can see why the decision was made. For a $4.99 game, I was a little taken back that Rogue Rocket Games also decided to include in-app purchases in the form of chapter unlocks at $.99 each, or an option to unlock the remaining four chapters and a set of bonus levels for $2.99. 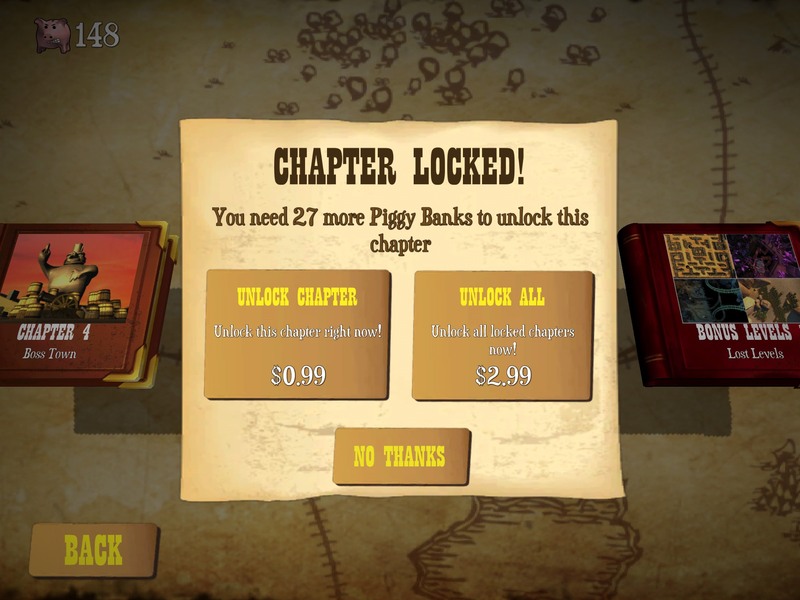 Certainly this is the developer’s way to allow those who have trouble acquiring enough piggy banks needed to unlock the chapters through traditional means a way to keep playing, but seeing a request for more money in a game whose press release touted it as being part of Apple’s “Pay Once and Play” category rubbed me the wrong way. That tidbit aside, Gunpowder is a clever game, and the original $4.99 asking price is well worth it for the whimsical art and explosive puzzle gameplay that’s included. Here we have the simple story of a hero trying to bring down the baddie told in such a classic cat-and-mouse way that Gunpowder will appeal to both fans of puzzle games and cartoons alike. COMMAND your crew of fearless pirates and buccaneers to epic victory!